Mandatory recycling in the City of Emeryville has been in effect since July 1, 2012 for businesses and institutions with 4 or more cubic yards of garbage service as well as multi-family properties with 5 or more units. Phase 2 of the Mandatory Recycling Ordinance began July 1, 2014, which adds food scraps and compostable paper to the “Covered Materials” list. It also requires all businesses to participate (not just those with 4 or more cubic yards of weekly garbage service). New! Businesses and institutions that generate significant quantities of organics (food scraps and/or compostable paper), such as restaurants and grocery stores:* Provide containers and service of sufficient number, size and frequency for organics. New! Businesses and institutions that generate significant quantities of organics, such as restaurants and grocery stores:* Place food scraps and compostable paper in separate organics cart/bin for organics collection. New! 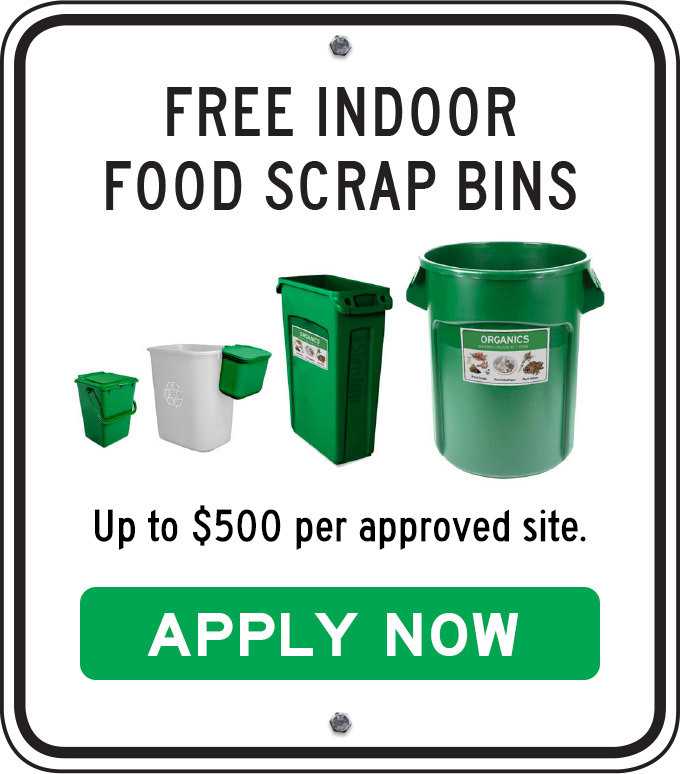 Provide containers and service of sufficient number and size for organics (food scraps and compostable paper) at the same or at an equally convenient location as garbage. The City of Emeryville contracts with Waste Management of Alameda County for garbage, recyclables and organics (food scraps, food-soiled paper and plant debris) collection services. Weekly pickup of recyclables and organics is provided to multi-family properties at no extra charge. Weekly pick-up of 264 gallons of recyclables and organics (200 gallons = 1 yard) is provided at no extra charge to commercial customers with two (2) cubic yards of garbage per week or less. Customers may elect any combination of containers for this free service. Commercial accounts with more than two (2) cubic yards of weekly trash service receive a 50% discount for recycling and composting service. For free indoor containers, printed posters, and decals, contact Marcy Greenhut at the City of Emeryville at mgreenhut@emeryville.org or (510) 596-3795. Below are downloadable support materials specific to the City of Emeryville. Additional support materials for any community are also available for businesses and institutions and multi-family properties.